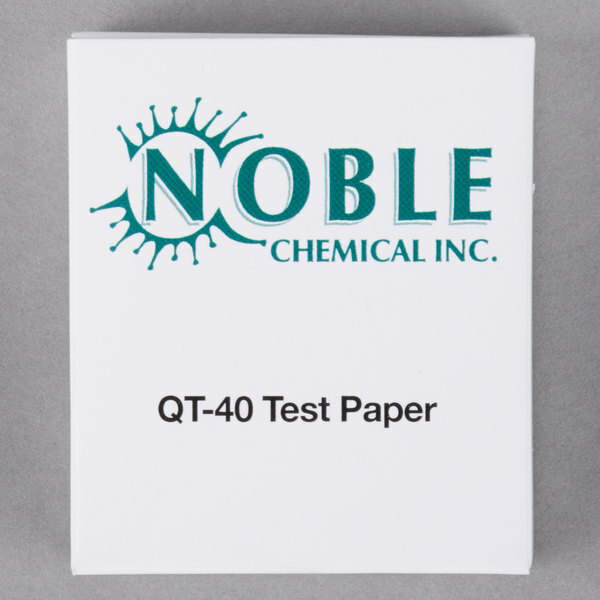 Use this Noble Chemical QT-40 quaternary test paper dispenser to ensure your solutions are safe for use. 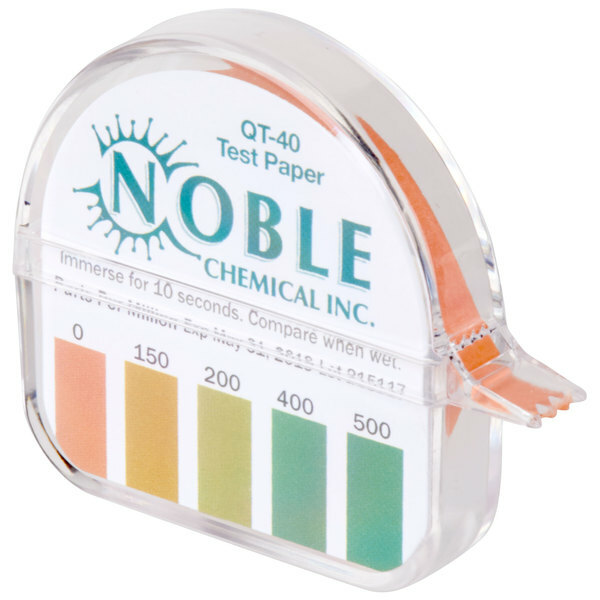 If you operate a restaurant, dining hall, cafeteria, healthcare facility, or foodservice establishment, then this Noble Chemical QT-40 quaternary test paper dispenser is an essential product for you. This kit enables users to easily measure the concentration of quaternary sanitizers, including n-alkyldimethylbenzyl and/or n-alkyl dimethyl ethyl benzyl ammonium chloride, and Rocall II. 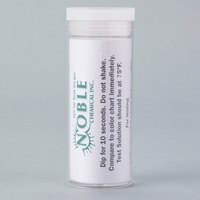 By having this dispenser on hand, you’ll be able to comply with Federal, State, and Local health regulations that require users of quaternary ammonium sanitizer solutions to have appropriate test kits available to verify the strength of their solutions. 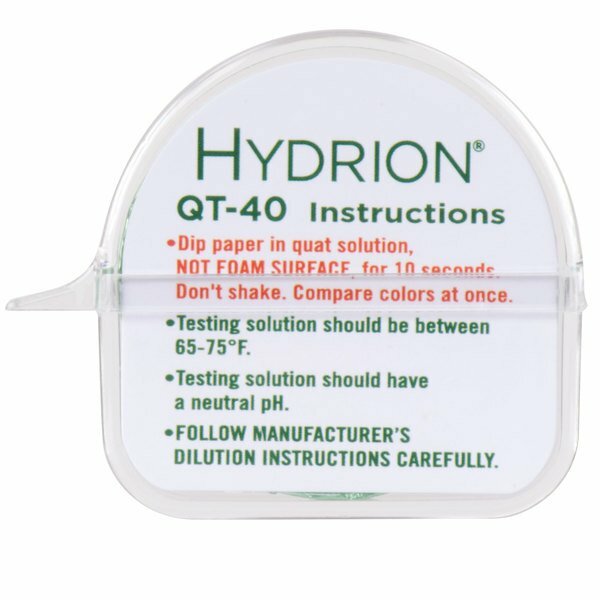 "Wow the squads tester strips are really nice I'm impressed it was very easy to use very easy to Rees read comparison chart you simply dip it into your sanitizer well you rip off a piece that's about as long as you wanted to be instead of just going with whatever size strips they…"
This quaternary test paper dispenser includes everything you need to start testing your sanitizer. 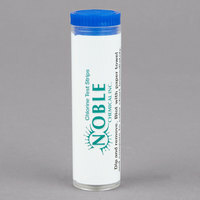 Each product purchased comes with a plastic dispenser, color chart, and (1) 15’ roll of test paper, which provides approximately 200 tests. 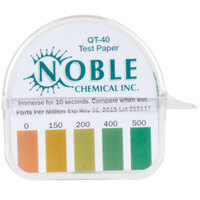 The test paper measures concentrations between 0-500 ppm, with color matches at 0, 150, 200, 400, and 500 ppm. The distinct color match at each full unit makes it easy to detect exhaustion of solutions that should be replaced. 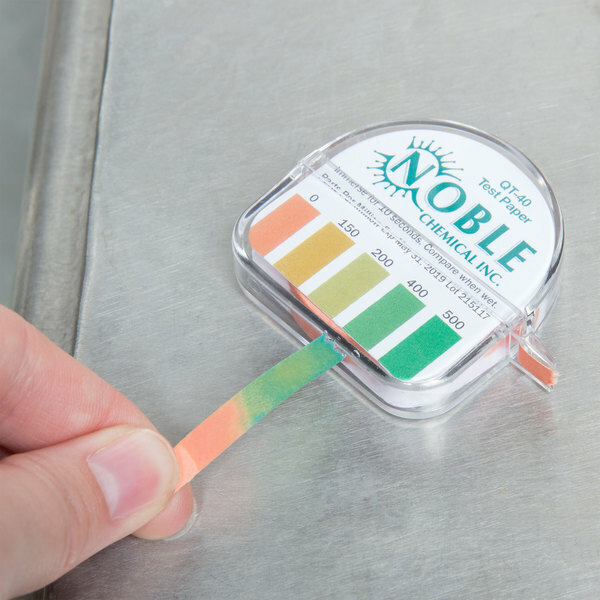 This test produces quick results. 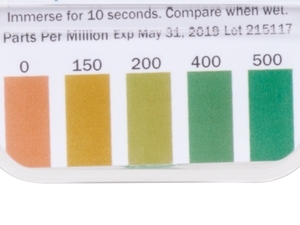 Simply tear off a small strip of the test paper, dip it into your sanitizing solution for 10 seconds, and instantly compare the resulting color with the matching chlorine color chart. This was smaller than I thought it would be so I have to not overuse it by peeling off too long a strip. The foil it was wrapped in and the plastic case helped during delivery if it had rained. The plastic case has a jagged tear strip or you can tear it by hand. On the insert it does say dip in quat solution so I have to purchase that to make sure readings are correct. 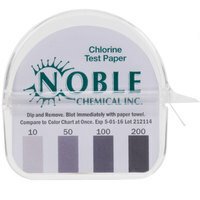 Be careful when you do get your test strips and see if you need quat or if you can use bleach water to test. 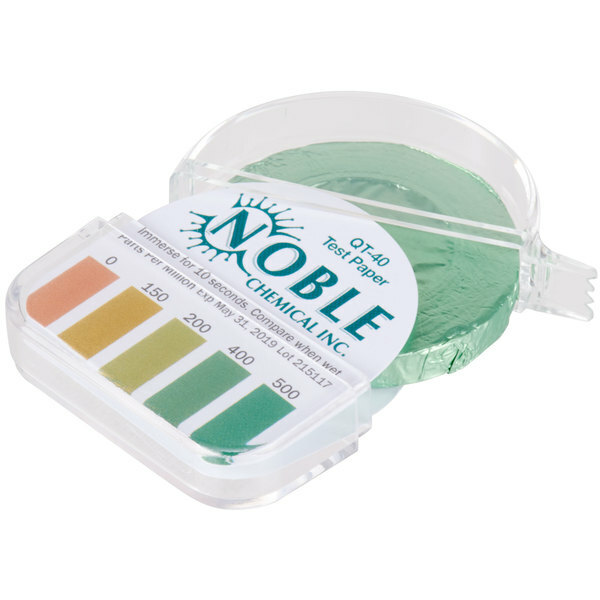 These Noble test strips making the testing process super easy. They've been successful in appeasing the local health department and give us an accurate read on our sanitizing solution. 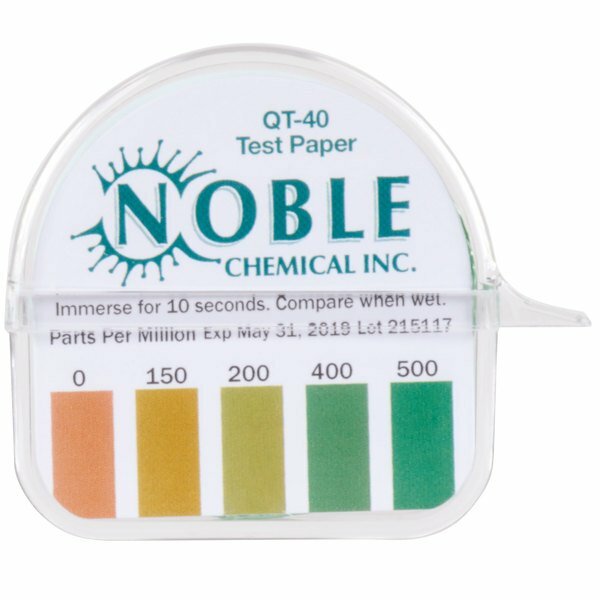 Great test paper for our sanitizer solution, it really takes the guess work out of my managing of employees. Now i can come behind the employees and ensure my chemicals are diluted correctly. The health department loves to see these. They are the most beneficial for me to be able to come behind new employees and ensure that they are using the chemicals correctly. 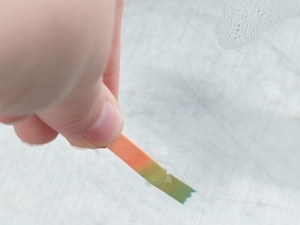 These test strip are incredible they take the guess work out of marking sure thing are clean. It is way read and the price is great. Handy pack to have around in case the shared commercial kitchen space runs out of sanitizer strips while I'm there. You never know what to expect sharing kitchen space so this item is part of my emergency back-up supply kit, my "inspection" kit I refer to it as! 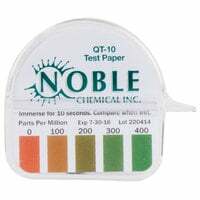 I am using everyday several times this hydrion quaternary test paper to check my sanitizer water as health department requires. It is very useful and quick result.